No, Mr. Gaga is not a film related to the singer who recently gave an outstanding performance during the half-time of the Superbowl. But the movie should appeal to those who are interested in modern dance and the steady and committed implementation of an artistic vision. 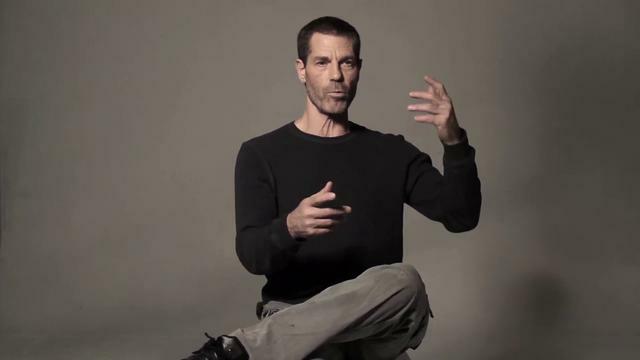 Directed by Tomer Heymann, the documentary is about dancer/choreographer Ohad Naharin who has developed a dance technique known as Gaga. He is also the head of the Batsheva Dance Company in Israel. I recently had a conversation with Heymann about the making of Mr. Gaga. Heymann said that he first became aware of Naharin back in the early 1990s. Heymann had a relative who kept offering him tickets to see the Batsheva Company. Heymann was not much of a dance aficionado and consistently turned down the offer of tickets. After about the tenth offer the relative said that Heymann should take the ticket or no further offers would be made. Heymann went to see a performance and described it as a life changing event. He said he was so ecstatic after the show that he went and threw himself into the nearby ocean. After some effort, Tomer was ultimately given access to an extensive amount of film footage going back to Naharin's youth. Heymann said that access to this footage dramatically changed the structure of the movie. Instead of being a survey of his current career, the film became a retrospective of Naharin's entire life. Born in 1952, the film covers the choreographer's early years in a kibbutz in Israel. A foot injury prevented him from serving in combat with the Israeli Army. During the Yom Kippur war in 1973 he served in a unit entertaining Israeli troops instead. Naharin began his formal dance training at the extremely advanced age (for a dancer) of 22. On a trip to Israel, Martha Graham spotted him and invited him to join her dance company in New York. Naharin was not happy with the experience and left the company after ten months. The documentary also chronicles Naharin's first marriage to fellow dancer Mari Kajiwara. She left her stellar career at the Alvin Ailey dance company to follow her husband to Israel in 1990 when he was offered the directorship of the Batsheva troupe. Kajiwara was apparently not happy with the move, keeping her watch on New York time. She tragically died of cancer at the age of 50. Naharin's cutting edge choreography which includes multimedia elements and at times addresses political themes apparently did not appeal to to the traditional Batsheva audiences. But others were attracted by the company's innovations and its visibility in the dance world rose. Although he seems like a relatively reserved man, the film shows that Naharin can be firm in the implementation of his artistic goals. Heymann said that an example of that artistic determination was a well publicized incident in 1998 which is featured in the film. Naharin and his company withdrew from participating in a gala celebrating Israel's 50 th anniversary rather than bow to significant political pressure to alter the dancers' costumes. Curiously, the film is rather allusive in giving a precise definition of the Gaga dance technique. The definition of it on the Batsheva Dance Company's website is rather expansive. Perhaps it is one of those techniques that is difficult to explain but is more easily observed, which can be done by viewing the documentary. hey people thanks for such great reviews as i have read this high quality piece after reading your great comments down here. https://www.topcelebrityjackets.com really looking for essay writing help as i want to pursue writing as a profession.